Bell's concept model of a vertical-takeoff-and-landing air taxi vehicle, as unveiled in January at CES (the Consumer Electronics Show) in Las Vegas. Two words for you: flying taxis. That's right. In the not-so-distant future, you'll open your ride-hailing app and, in addition to ground options like car, SUV, scooter or bicycle, you'll see on-demand air flight. At least that's according to the optimists at South by Southwest, the annual tech-music-film convention in Austin, Texas. When the flying taxi comes, most of us will be passengers. We might hail it on our smartphones and head to the rooftop, where a ride is waiting at the helipad. It might look like a minivan with wings and four seats; or more like a gigantic drone. 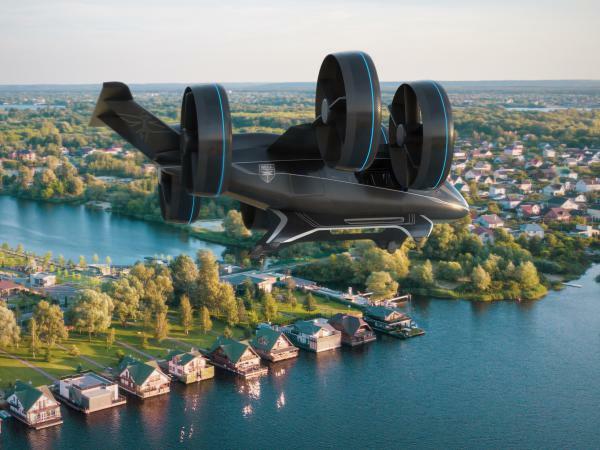 "If air taxis are going be what everybody wants them to be — thousands at a city, for example — we won't be able to find enough conventional pilots," said Carey Cannon, chief engineer of technology and innovation at Bell. In a crowded pavilion at South By Southwest, Cannon has set up a virtual reality simulation of what it feels like to drive one of these small flying vehicles of the future. I decide to try it out. He puts a headset on me and something like a joystick in my hand. I slip into a gamer chair. Only, I'm more than a gamer. I'm a trainer for Bell's computer software. I turn a dial for my VR flying taxi to lift off into the Las Vegas skyline. Only, I turn it too fast and it's a dizzying takeoff. "Don't overreact," Cannon tells me as I push pedals and the joystick as aggressively as possible. "Smooth, small movements," he says, advising me to do the exact opposite of what I'm doing. How I and others drive will create training data for the artificial intelligence that'll take over much of the job. The dream of flying cars is as at least as old as the automobile itself. Bell, which makes attack helicopters for the U.S. Navy, is working on this new project with another high-profile partner, Uber. The prototype, the Bell Nexus, was unveiled earlier this year. Boeing and Airbus also have prototypes of these flying cars in the works. 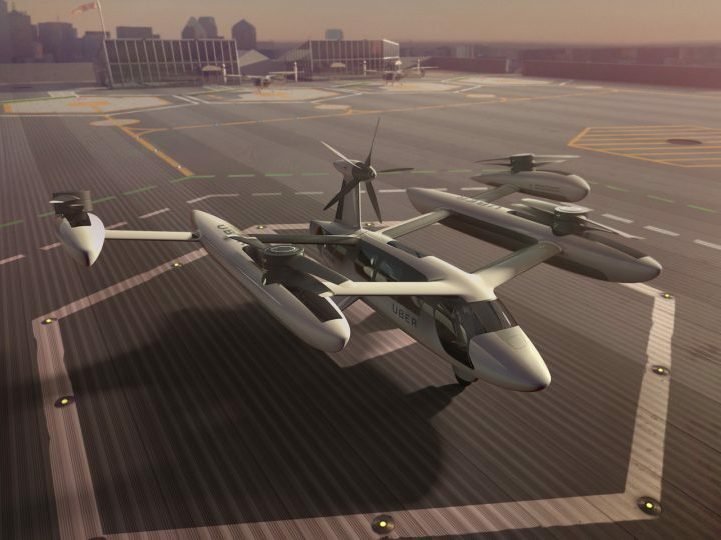 An illustration of a concept model of Uber's all-electric, vertical takeoff and landing aircraft. Uber has become the face of the aerial mobility movement as it has the most public campaign touting its work so far. Elon Musk says he'll get us to Mars. Uber says it'll get a millennial from San Francisco to San Jose in 15 minutes flat (instead of the two-hour slog in morning traffic). And its timeline for this flying taxi that does not yet exist is 2023. The company laid out the challenges and opportunities of the flying taxi in a 2016 report, "Fast-Forwarding to a Future of On-Demand Urban Air Transportation." In the highly cited white paper, Uber says: "Just as skyscrapers allowed cities to use limited land more efficiently, urban air transportation will use three-dimensional airspace to alleviate transportation congestion on the ground." At a panel I moderated at SXSW, subtly titled "Death to Roadways," I asked the audience if they believed Uber's goal of flying taxis in four years. Half the room raised their hands. And when asked if they thought the taxi would be an option within a decade, nearly all hands went up. NASA is another Uber partner. Jaiwon Shin, NASA's associate administrator for the Aeronautics Research Mission Directorate, was on the panel. While he thinks Uber is being a little bullish — he'd put the timeline further out, to the mid-2020s — Shin says it's close. "Convergence of many different technologies are maturing to the level that now aviation can benefit to put these things together," he said. The batteries that power electric cars can evolve further, to power flight. Companies can stockpile and pool data, and build artificial intelligence to take over air traffic control, managing the thousands of drones and taxis in the air. And Uber, his partner, is really well-connected. While fighting the legacy taxi industry, Uber made so many government and lobbyist contacts, that that Rolodex can help grease the wheels — or wings. To move quickly, Shin says, technologists and policymakers will need to coordinate. "If one segment is lagging behind, this is not going to happen," he said. China may beat out America, Shin says, because China has a "higher tolerance level for risk" in the development of new technologies. That could give China a "competitive advantage," according to McKinsey consultant Shivika Sahdev, who advises governments. When a company wants permission to fly its imperfect prototypes over densely populated mega-cities, she says, "that's where the vehicle operators will go, that's where the system providers will go to, to be able to actually test it in the real world." When we build the whizbang future, it's good practice to pause and consider the downsides. Right now in major cities, people in bumper-to-bumper traffic or riding the subway have to see each other (at least for a tiny bit). With flying cars, the haves can escape to the air and leave the have-nots forgotten in their potholes. That's the worry Cheryl Garabet expressed when she stepped to the microphone at the panel discussion. "I think of ... all of us with money flying around, you know, looking down at the poor homeless, who have no options in that regard," she said. "How can cities prepare so that there's not this awful dystopian future for all of us with flying vehicles?" It was a strong dose of skepticism to balance the techno-optimism. While no flying taxi exists yet, Uber has dared to estimate the "near-term" cost of that San Francisco to San Jose trip: $43. Two words for you - flying taxis. That's right. In the not-so-distant future, you'll open your ride-hailing app. And next to car, SUV and bicycle, you'll see this option - flying car. At least, that's according to the optimists at the South by Southwest conference. Here's NPR's Aarti Shahani. AARTI SHAHANI, BYLINE: You might be the passenger who hails a taxi and heads to the rooftop, where, at the helipad, your ride is waiting. It might look like a minivan with wings and four seats or more like a gigantic drone. Either way, it won't fly itself any time soon. One seat will be reserved for the driver pilot. CAREY CANNON: If air taxis are going to be what everybody wants them to be, you know, in thousands at a city, for example, you won't be able to find enough conventional pilots. SHAHANI: Carey Cannon, a chief engineer at Bell - we're in a crowded pavilion at South by Southwest, the annual tech, music, film convention in Austin. Cannon has set up a virtual reality simulation of what it feels like to drive one of these small, flying vehicles of the future. CANNON: OK. I'll walk you through it a little bit. She's just about to go. SHAHANI: He puts a headset on me and something like a joystick in my hand. I slip into a gamer chair, only I'm more than a gamer. I'm a trainer for Bell's computer software. CANNON: All right. Now go ahead and roll the thumb wheel up to give it some power. SHAHANI: How I and others drive will become data, training data for the artificial intelligence that'll take over much of the job. My VR flying taxi lifts off into the Las Vegas skyline. CANNON: You're just following the green dots as they go. The dream of flying cars is at least as old as the automobile itself. Bell, which makes attack helicopters for the U.S. Navy, is working on this new project with another high-profile partner - Uber Technologies. Boeing and Airbus also have prototypes of these flying cars in the works. Uber has become the face of the aerial mobility movement as it has the most public campaign touting their work so far. Elon Musk says he'll get us to Mars. Uber says they'll get a millennial from San Francisco to San Jose in 15 minutes flat. And their timeline for this flying taxi that does not yet exist - 2023. I moderated a panel at South By. By way of show of hands, how many of you believe it? Jaiwon Shin with NASA, also an Uber partner, was on the panel. While he thinks Uber is being a touch bullish - he put the timeline further out to the mid-2020s - Shin gives his thesis for why it's close. JAIWON SHIN: Convergence of many different technologies are maturing to the level that now aviation can benefit to put these things together. SHAHANI: The batteries that power electric cars can power flight. Companies can stockpile and pull data and build artificial intelligence to take over air traffic control, manage the thousands of drones and taxis in the air. Also, his partner Uber is really well-connected to politicians and regulators. Shin says to move quickly, it'll take technologists and policymakers coordinating. SHIN: If one segment is lagging behind, this is not going to happen. SHAHANI: When we build the whiz-bangy (ph) future, it's good practice to pause and consider the downsides. That's what South by Southwest attendee Cheryl Garabet did when she stepped up to the mic. Right now, in major cities, people in bumper-to-bumper traffic or riding the subway have to see each other. With flying cars, the haves can escape to the air and leave the have-nots forgotten in their potholes. CHERYL GARABET: I think of a very dystopian - all of us with money flying around, you know, looking down at the poor homeless, who have no options in that regard. Like, how can cities prepare so that there's not this awful dystopian future for all of us with flying vehicles? SHAHANI: A strong dose of skepticism to balance the techno-optimism - while no flying taxi exists yet, Uber has dared to estimate the near-term cost. That San Francisco to San Jose trip - $43. Aarti Shahani, NPR News, Austin. (SOUNDBITE OF SNARKY PUPPY'S "BLING BLING") Transcript provided by NPR, Copyright NPR.